Hypertech Max Energy programmers are designed to maximize your gas our diesel truck's engine, while also allowing for the customization of other shift points, speedometer, throttle response, and much more. The Hypertech Max Energy programmer is designed to pull out every ounce of energy from a fuel molecule, ensuring a higher performing engine and better fuel economy. They not only offer additional power but also optimize transmission shifting. There are two optimized programs for gas powered engines and three for diesel, giving you many tuning options to choose from. If you are a truck guy who's replaced small factory tires for larger custom tires, you know your rigs speedometer won't read correctly. But the Max Energy tuner will allow you to program your speedometer to the correct setting. Hypertech has thought of everything when designing this programmer, giving you the ability to raise your vehicle's top speed rating. 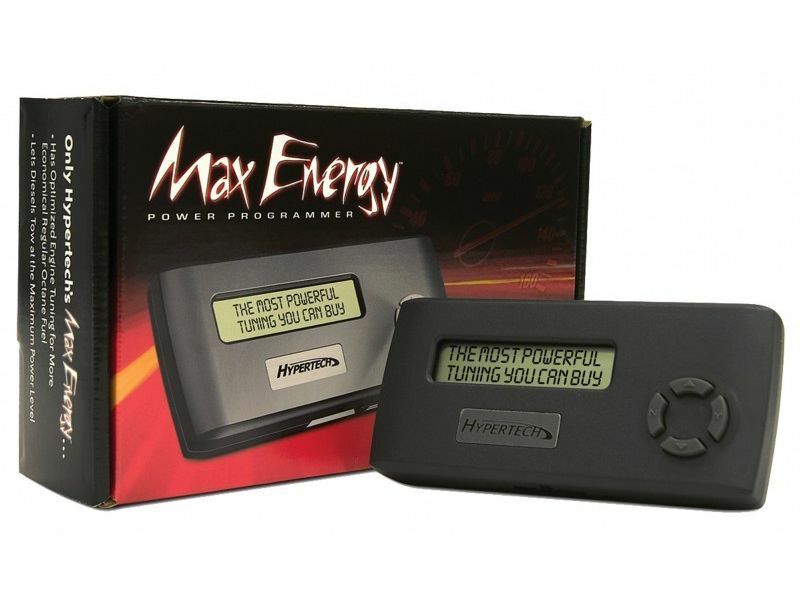 If you want to maximize driving performance, the Max Energy power programmer will induce a shifting tension increase. And when towing, this chip ensures less transmission slippage as well as stable oil temperatures. Hypertech Max Energy programmers are simply amazing. They offer online updates at a click of a mouse as well as allowing you to check and read diagnostic codes. Get your car or truck one of these engine tuners today and don't expect anything less than the best. All Hypertech Power Tuning Products are warranted* against defects in materials or workmanship. Hypertech’s liability under this warranty shall be limited to the prompt correction or replacement of any defective part of the product which HYPERTECH determines to be necessary. This Limited Lifetime Warranty is to the original purchaser for as long as he or she owns the vehicle on which the product is originally installed, providing all the information requested is furnished. You must retain a copy of your original sales invoice or receipt. Without proper documentation, a service fee will be applied. Resold units are NOT covered under this warranty. If you take your vehicle to a dealer or mechanic for service, you must first remove the Hypertech Power Tuning and restore the stock programming. This is because diagnostic devices expect to find stock calibrations and will often overwrite the program if the latest stock calibration is not found in the computer’s memory. This will result in the loss of your Hypertech Power Tuning data. The Power Tuning can be easily removed to restore the stock tuning before you take your vehicle in for service, enabling the service technician to upgrade your stock calibrations. After the service is complete, you can reinstall your Hypertech Power Tuning. If you have any questions related to service issues, please call Hypertech at 901.382.8888. The Max Energy Power Programmer takes only minutes for installation. To get started, locate the OBD2 port under the dash of your vehicle and connect the data cord between the port and your programmer. Once the programmer is connected to the port simply follow the directions as the programmer walks you through the installation. For additional information please call us at 1-877-216-5446 or 701-253-5906.